Picnics and barbecues. Parades. Weekend beach getaways. Last days by the pool. These are what most people think of when the words “Labor Day” come to mind — enjoying time with friends and family as most people have that day off. However, reading the history of Labor Day below will show you just what we are celebrating on this special day. 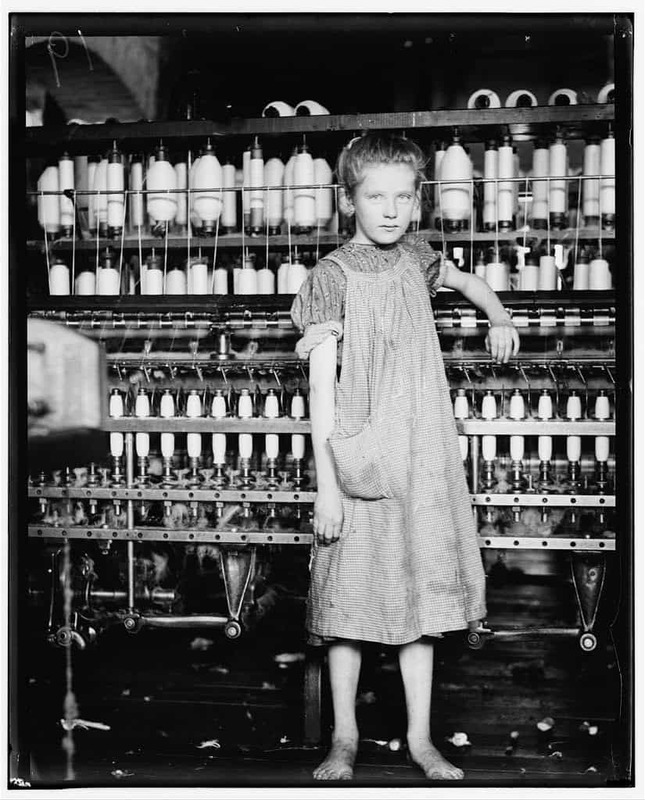 The little girl pictured above worked in a mill. She told the photographer she was twelve, although her coworkers all said she was ten. More than 100 years ago the labor force was completely different than it is today. Men, women, and even children of five and six labored ten to twelve hours a day for little pay, seven days a week. There were no weekends. No sick leave days. No vacation days. No over-time pay. Working conditions were often dangerous and unsanitary. In 1872, a New York City carpenter by the name of Peter McGuire rallied over 100,000 workers to go on strike and march through the streets of the city, protesting these conditions. Many people have credited McGuire for the idea of Labor Day. McGuire fought for a decade to earn rights for workers. Workers began organizing into labor unions to fight for higher pay, shorter days, and rights for children. They fought to set an age limit on the children who worked to prevent them from injuries. Finally, in 1882, McGuire had the idea to designate one day as a special holiday for workers. Labor Days in the late 1800s typically consisted of street parades followed by festivals for workers and their families. Elected officials used the opportunity to speak, and picnics and celebrations abounded. Then, in 1894 Congress passed a federal law declaring the first Monday every September as Labor Day. Before you try any of the ideas below, make sure to talk to your kids about the history of Labor Day, and the conditions that many adults and children lived and worked by just to survive. Ask them to picture themselves working like that, and compare and contrast their lives with the lives of people who lived before laws were made to protect workers and children. Have children create an “Occupation Collage.” Provide magazines and newspapers for children to look through and find workers. Cut out pictures of various workers in our country. Glue and display the pictures onto colorful, patriotic paper. Thank You Cards. Show your children how to write/stamp the words “Thank You.” Allow them to stamp the words onto paper. The children can decorate cards then deliver them to community helpers (Library, Fire station, Police Station, Post Office, etc.). Have children choose an occupation. They can draw a picture of the specific worker then together brainstorm a list of the responsibilities or things a person must do for the job. Thank you cards are also perfect for elementary students! Also consider the folks that pick up the trash and deliver the mail (but nothing inside the mailbox, please!) Consider adding some freshly baked cookies to your thank you! Interview. Children can select a few jobs that interest them or that they want to know more about. Schedule interviews with people in the community and allow the children to conduct the interview after first working together on listing appropriate questions to ask. Build a Resume. Middle school students can research what skills and education are necessary to obtain jobs they might be interested in. Have them create a “future” resume of what they would need to accomplish in order to be chosen for a job in that specific field. Volunteer. Have your high school students choose a job that they would like to pursue. Have them arrange a day where they can volunteer or shadow someone in that profession to experience the responsibilities and commitments that are necessary for success. So… I’d love to hear how your discussion went! Tell me in the comments. I agree, Aliece! Labor Day is one of those holidays that I never quite understood as a child. Learning more about it helped me appreciate what people of the past, especially children, had to endure before labor laws came into play. I am glad you liked the activity suggestions and enjoyed the post!